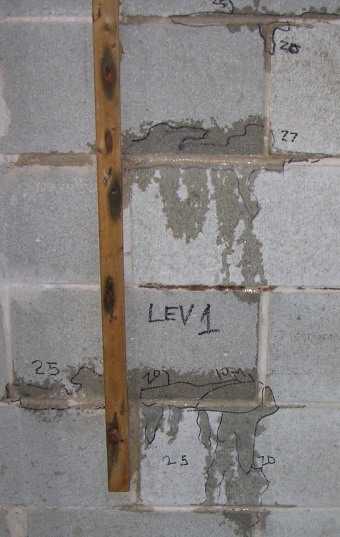 Mark Meshulam is an expert witness and consultant for split face block leaks. Being market driven, your Chicago Window Expert has been driven into the world of masonry by Chicagoans driven to distraction by leaks driven through split face block walls. Is this onomatopoeia? Sadly, no. What is split face block? Split face block is a variation of concrete block, otherwise known as CMU (cement masonry units) or even “cinder block”. The split-face variety has an irregular exterior face designed to look like chiseled stone, and the effect works. Split face has a warm appearance that is far more attractive than flat concrete block. In fact, if I was blind, I would say it looks exactly like chiseled stone. For this reason, literally hundreds of developers in the past 20 years chose split face block as their exterior wall material for the sides and backs of 3 flats, 6 flats and other multi-unit residential buildings. 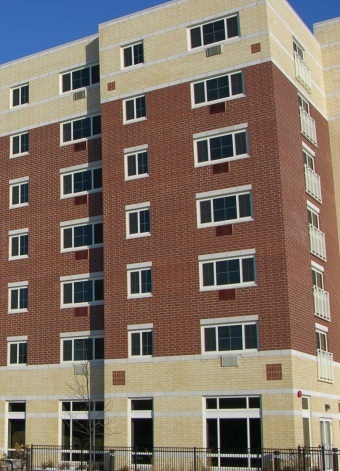 They generally used higher quality glazed brick on the front of the buildings, resulting in fewer leaks there. But the split face block leak! So we should blame the block, right? Fifteen minutes into the spray rack test, these leaks appeared on the interior of the split face block. This mason knows what he is doing. Through-wall flashing in block backup wall is a few courses above the lintel location. Tiebacks are seen dotting the face of the block. Not so fast. It’s easy to trash split face block as a “bad” material and to condemn the developers as greedy and evil. That is an amusing pastime in many HOAs. But from what I am seeing, these developers tried to put together a decent product. They often used nice exterior design and decent interior finishes. Unfortunately, they appear to be ignorant of certain simple facts of construction. And if they are ignorant, maybe it is actually their architects who are to blame. 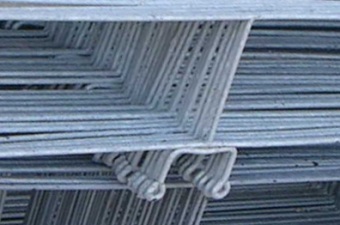 Galvanized wire tiebacks are bedded in mortar joints so that the little loops project out, available for hooks coming from the face brick, to engage. Whomever deserves blame for the split face block leak fiasco, the unfortunate current owners are left holding the soggy bag. Having been called to many buildings with split face block leaks, I found a few where the leaking was so bad that the interior drywall had to be removed. This afforded me a rare glimpse of the interior side of a leaking split face block wall, wetting in real time. 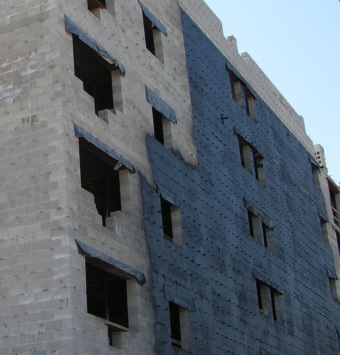 Bituminous waterproofing is sprayed on the face of the block backup wall prior to installation of the face brick. Yes! With the use of a spray rack, I was able to induce active leaks in just a few minutes. Check out the pictures at the right and the video below for some fairly shocking imagery. This could be happening inside your walls! The finished product is not only attractive, but it .will provide many years of leakproof use. It\’s all the design. All masonry leaks. Split face block just leaks more. It’s more porous. Newer masonry leaks more than older masonry. This is because older masonry is generally more massive. In the old days, masonry was used to actually hold up the building (the Monadnock Building has structural masonry walls 8 feet thick at the base). A smaller older building may easily have three or more wythes (thicknesses) of brick. The sad building we sprayed in the video had only one wythe of hollow split face block and the leaks appeared on the inside of the block quickly. As our buildings evolved, masonry became an ornament, not structural. Other stuff, like steel studs, were needed to hold it up. Yet other stuff was needed to make it waterproof. 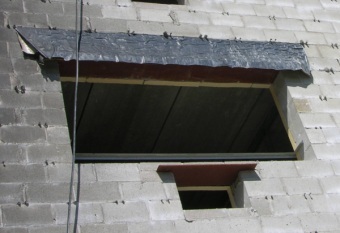 We began to utilize masonry cavity walls, sometimes called masonry veneer walls. In this scheme, an inner wall of concrete block or studs with sheathing, is built. Then the masonry veneer wall is built to the outside of the inner wall with an airspace between the two. Intermittent connecters tie the two layers to one another for stability. The outside of the inner wall is waterproofed, so that water that penetrates the face brick will simply drain down to the bottom, where metal or rubber flashings direct the water outside. Then some brilliant, cost cutting builder thought, “Who needs the waterproofing?” And that started the moist, slippery path we see today. And then the next brilliant, cost cutting builder thought, “Who needs a glaze on the brick? And then the next brilliant, cost cutting builder thought, “Who needs brick (a dense clay mixture fired in a furnace) at all? Why not just use lightweight, hollow concrete block instead? And thus the once-proud masonry wall (there is even a society that uses the surpassing strength and mystical beauty of masonry as a metaphor for the way one should live one’s life – ever hear of the Masons? Illinois Masonic Hospital?) has been cheapened by degrees so that it doesn’t even hold itself up any more, let alone keep out the rain. Masonry (including split face block) needs a waterproof barrier behind it and an airspace to allow water to drain. 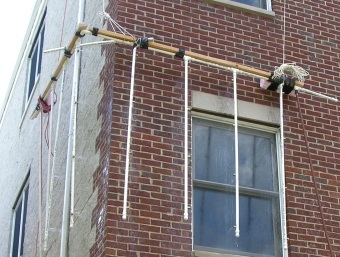 Masonry needs tiebacks that connect it to structure behind it, yet these tiebacks must not violate the water barrier. Masonry needs metal or rubberized flashings at the bottom of all parts of the wall, to capture water and direct it to the outside. 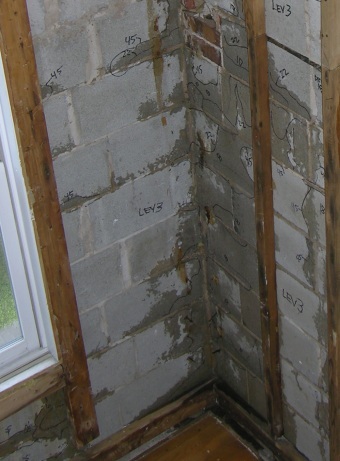 Masonry needs weeps or openings in the masonry to allow water accumulated on the flashings to flow outside. You can get masonry leaks, including split face block leaks if the drainage path is obstructed with mortar droppings in the wall cavity. Masonry needs decently mixed and applied mortar joints, to keep the amount of water penetrating the wall to a minimum. Masonry needs a glaze, coating or inherent water repellant to reduce the amount of water entering the wall. If you are saddled with split face block leaks, fear less, because help is on the way. Your ChicagoWindow Expert has consulted with some of the top providers of solutions, and we have some that will work right now. 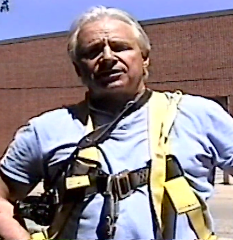 Mark Meshulam, Chicago Window Expert, discovers that masonry leaks too! Need to fix a leaky masonry wall?